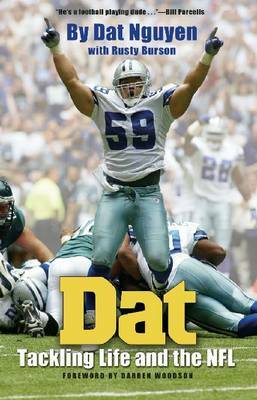 In a quintessentially American game, for an organisation often called America's Team, Dat Nguyen stands as the first player of Vietnamese descent ever to play in the NFL. Yet if asked for his job description, he would probably answer simply, ""I tackle"". He tackled so well at Rockport-Fulton (Texas) High School that he earned a scholarship to Texas A&M University, becoming the first Vietnamese American football player in school history. As part of the storied ""Wrecking Crew"", Nguyen's tackling earned him All-American honours and led the Aggies to their first Big 12 title. And, even though he was once deemed too small to play middle linebacker in the NFL, he has earned All-Pro recognition with the Dallas Cowboys. For Dat Nguyen, though, tackling the various obstacles of life-not just running backs-gives him the most pride. He learned how to tackle life from his parents, who narrowly escaped from the North Vietnamese Army in 1975. Nguyen offers the story of his faith, his family, and his career, a true story of the American dream lived out, as an inspiration to others. He recounts his father's decision to flee Vietnam; the boat trip that took his family to freedom; and their eventual settling in Rockport, Texas, where a community of Vietnamese shrimpers established an economic livelihood using skills brought from the old country. He describes the racism his family encountered while he was growing up and how the friendship of one young Caucasian boy and his family overcame prejudice through an invitation to participate in sports. Nguyen's insightful look into the life of a big-time football player offers first-hand glimpses of the personalities and playing (or coaching) styles of many celebrated stars of college football and the NFL. His stories offer excitement, romance (as he pursues his college sweetheart, now his wife), faith, fatherhood, and humour. Dat is a lively, engaging story of growing up in a refugee family, of big-time football, and of human struggle and success.